Audio cables have become part-and-parcel of the modern entertainment scene. They are used to connect the sound systems including home theaters, televisions, stereos, phones and other devices to the speakers. Unfortunately, finding the desired item is a bit of the challenge due to the many types. It is tiring of the low-quality sound; noisy transmission, electromagnetic interference (EMI) and cables that keep coming loose even at the slightest touch. 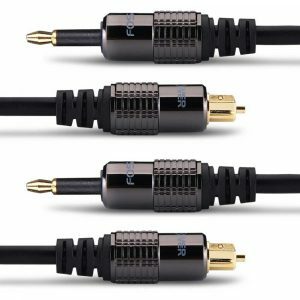 In this article, we will focus on the important features to look at and also outline the best audio cables that are available in the market. Our aim is to help you have a better sound listening experience and also save time and effort during the search. Shielding: Proper cables come with good shielding/sheathing that prevents electromagnetic interference (EMI) and protects the inner core. Other key aspects include durability, tight grip, compatibility, and versatility. Marketed as among the world’s slimmest audio cables, VOJO cable has won hearts for being durability, flexible, and resistance to noise and corrosion. It features 24k gold-plated connectors while the cable is protected by a strong sheath. The handy accessory will easily fit in 3.5 mm audio portal and will remain intact thanks to its solid grip. The heavy-duty solid steel tubes together with the semi-gloss TPU jacket give it the much-needed strength. It would have probably topped this list if it was longer, not too light and wasn’t so tightly coiled. 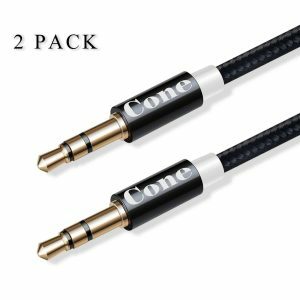 The Cone audio cable allows you to connect devices like home stereos, headphones, iPhone, MP3 players, computers, laptops and more. It features 2 units each measuring 3.3 feet long and works with 3.5mm aux ports. The outer layer is made from sturdy nylon while the end connectors are made from 24K gold-plated metal. Reasons to buy this product include seamless sound delivery, combat signal loss, slim design, and offer a firm connection courtesy of the beveled step-down design. The FosPower audio cable comes in a 2-pack and measures 6 feet long. 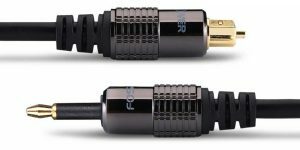 It features 24K gold-plated connectors and is Toslink to mini-Toslink digital optical cable. The cable consists of 3.5mm metal connectors and fiber optic core and works with televisions, iMacs, laptops, Notebooks and more. For added strength, it features a strain relief PVC jacket. Good quality, low noise, and corrosion resistance are some of the cable’s strong points. However, it doesn’t support analog to digital conversion, DTS-HD Master or Dolby TrueHD audio. 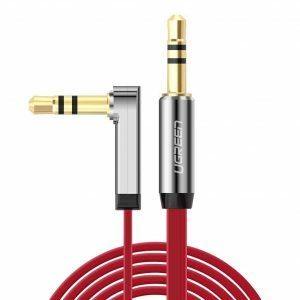 Made for devices such as speakers, tablets, iPads, iPod, MP3 players, and smartphone, the UGREEN audio cable features 24K gold-plated male-to-male connectors and is compatible with 3.5mm jacks. Its slim and flexible nature plus right-angled connectors make using it in tight spots easy. The oxygen-free copper minimizes noise and electromagnetic interference assuring you of high-quality sound. It’s loved for its flexibility, compatibility with many devices, firm hold, and resistance to corrosion. 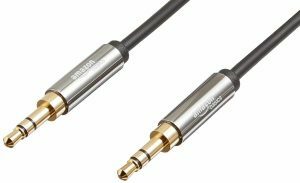 High fidelity sound is what the AmazonBasics audio cable claims to offer. It comes in male-to-male style and measures 1.2 meters/4 feet long. The accessory will plug in devices featuring 3.5mm or AUX-in ports. This includes MP3 players, smartphone, laptops, notebooks, etc. It’s recommended because of the good sound thanks to the gold-plated plugs, minimal interference courtesy of reliable shielding, and good flexibility. 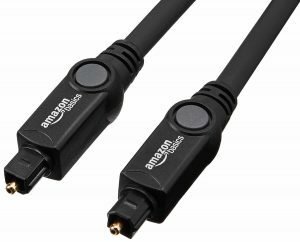 This Toslink cable by AmazonBasics measures 1.8 meters/ 6 feet long. It connects devices like television, sound bar, audio processor, preamps, receivers, laptops and more. The outer layer is made from solid but flexible PVC while the inner core is constructed from fiber optics. 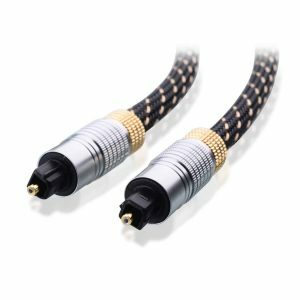 For high fidelity sound and minimal interference, the connectors are made from gold plated metal and also feature buffer tubing. According to a number of people, the cables are fairly thick and the plugs large. The Anker auxiliary cable scores well in many areas. Firstly, it is not affected by minimal noise and electromagnetic interference thanks to the quality inner core and 24K gold plated connectors. 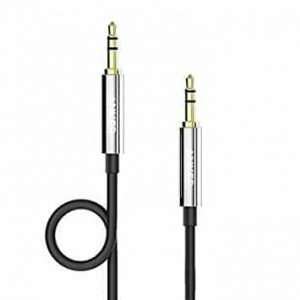 Secondly, it comes with ultra slim extensions for using with small aux jacks such as those found in phones and tablets. Thirdly, the premium metal housing is stronger than plastic and provides longevity. The Cable Matters Toslink Digital Optical cable is designed to deliver high quality at all times. It is used to connect to satellite DVRs, televisions, Blu-ray players, game consoles, DAT recorders, digital optical interfaces. The cable core is made from fiber optics, the connectors from gold-plated metal, and the outer surface from PVC. To make it sturdier and prevent nicks and cuts, the jacket is braided. It also supports compressed 5.1 and 7.1 or uncompressed PCM audio. 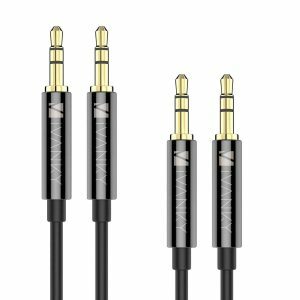 This auxiliary audio cable from Ivanky is male-to-male piece features 24k gold-plated connectors and is designed for 3.5 mm audio ports. The pure copper shell maintains high fidelity sound and doesn’t suffer from interference. Its key merits include compatibility with the car stereo, portable speakers, Hi-Fi units, NP3 players, tablets, phones and more. It’s also ultra durable and very flexible thanks to the soft TPE. 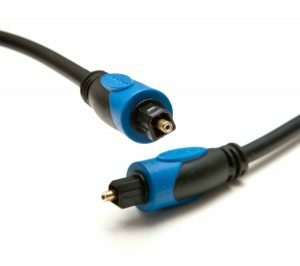 The BlueRigger audio cable delivers top notch sound with minimal signal interference thanks to the precision polished optical connectors. 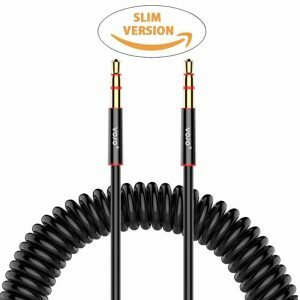 Its relatively long length of 6 feet also makes connecting distant devices easier while the sturdy PVC outer layer protects the sensitive core and extends its longevity. It is praised for the signal transfer accuracy, compatibility with many formats including Dolby Digital, ADAT’s, S-PDIF, DTS, and strength. Enjoying the quality sound and save yourself from the inconvenience and stress of going through the many items by reading this review. All the accessories have been verified and confirmed to offer reliable and long-lasting service. They are well-made, strong, cancel noise, resist EMI and are compatible with most devices on the market. Additionally, they come from well-known brands, are backed by affirmative reviews and can be bought from Amazon via the attached link. Choose the best and have a stress-free experience.